Has Britain finally cornered itself? After a week of travelling I came back to see that Moody’s has finally pulled the trigger on the country where I currently reside. This is such a non-story that it feels stupid to even mention but I suppose it will be making headlines for a little while longer. And this is a very good thing. Before I start, however, I would like to thank the British government for conducting a massive social experiment, which will be used in decades to come as a proof that a tight fiscal/loose monetary policy mix does not work in an environment of a liquidity trap. We sort of knew that from the theory anyway but now we have plenty of data to base that on. Secondly, I will be referring to my favourite IS/LM model. If you want to read more about it, a very good tutorial can be found here. When looking at record low cost of borrowing, a severely depressed economy and a central bank that does not even pretend anymore to be independent or targeting inflation the recipe should probably be to spend more. In the standard IS/LM model an increase in government spending over taxes (i.e. boosting the deficit) pushes the IS curve to the right. Thus, both the output level and the level of interest rate will increase. Consequently, the exchange rate should appreciate as capital flows to the country in question. This in turn leads to widening of the trade deficit. Ideally, the government would want the Bank of England to step in and limit the increase in interest rates (a.k.a. QE) so that the currency does not appreciate. And, as I mentioned before, the BoE is more than willing to do so. The relationship is pretty strong, which is why many people are calling for debasing of the sterling, particularly after G20 gave a pale-green light to such activities for countries, which are effectively in a liquidity trap. 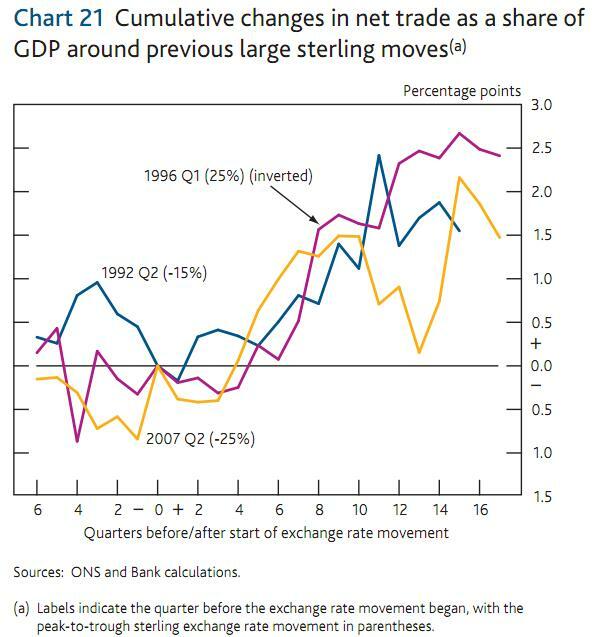 The second chart shows why debasing of the sterling makes an awful lot of sense. It shows two measures of the International Investment Position – the standard one (i.e. with FDIs at book value) and what I would call a “market” one (i.e. with FDIs at market value). 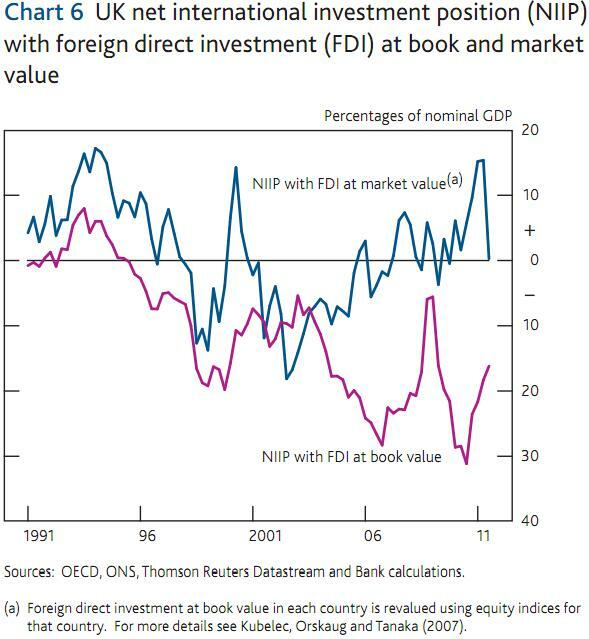 You can see that the UK is looking quite a bit better if you take into account the actual values of FDIs. I would suggest that the recent rally in global equity prices has at least kept the blue line in the positive territory. This essentially means that GBP devaluation not only boosts the terms of trade but also makes the UK richer. Not very many countries are in such a pleasant situation (think of many emerging economies with significant external debt). Again, weakening of the sterling does seem to be a very appealing strategy for the authorities. There is, however, one important problem – GBP devaluation is unlikely to bring extra revenues to the government and could actually make the fiscal position a bit worse. Here’s why – devaluing one’s currency and narrowing of a current account deficit means that the country’s savings are increasing in relative terms to investments. Granted, this may well have to happen considering a huge stock of private debt but this is not desirable from the growth point of view. On top of that, the J-curve effect dictates that the initial impact of currency devaluation will be actually adverse. What I am trying to say is that while GBP devaluation has a lot of positive sides, it will probably not work on its own because it will further depress domestic demand thus putting a strain of public finances. Therefore, I do believe that Britain has finally cornered itself into a situation where there is overwhelming evidence that Mr Osborne should really start spending. He should also assume that Mr Carney will not let that spending lead to appreciation of Real Effective Exchange Rate (a bit more on that mechanism in one of my previous posts entitled “Be careful what you target or am I in the right church?“). That is to say that the Bank of England will keep nominal and real rates very low. In my opinion this is the only rational way of the situation that we’re currently in. Then again, I am assuming the impossible here, i.e. that the politicians know what the stop-loss is. How to trade this? I don’t normally trade anything related to the UK (except GBP/PLN) but I would assume that any sell-offs in Gilts should be used as an opportunity to buy. As far as the sterling is concerned, the fact that exports outside of the eurozone are now bigger than to the eurozone, EUR/GBP is a cross that doesn’t make that much sense. I would very much prefer the cable, or better yet selling the sterling against EM currencies as this is where the adjustment in trade balances will have to come from. Nothing here is intended to be investment recommendation or should be construed as one.